After I complained so much about the weather in last week’s blog we’ve been graced by two or three days of sun, as if God decided to trade in his old black and white television set for a colour one, and the world is no longer being broadcast in a grainy monochrome by people in dinner jackets with clipped, posh accents. It’s amazing the difference the sun makes, especially up here. As above, so below, as the medieval mystics used to say, and it’s true to the extent that a bright blue sky turns the sea blue too—and when you add to that a fiery sunrise, well, it’s pretty spectacular in a wrath-of-Jehovah sort of way. We had to go to Inverness last Wednesday, and driving down the twisty coast road at around 8.30 a.m. we watched the sun rise behind the clouds like a candle flame shielded behind cupped fingers (while at the same time neglecting to watch the road—which explains why the last words of so many Caithness visitors are, “Wow, isn’t that beautifaaarrrghhh…”). Some good news—I’ve finally got a hospital appointment later in February for getting my eye sorted, the one that’s afflicted by posterior capsule opacity. (In retrospect, I wish I hadn’t read the article about how it’s fixed by firing a laser at it, punching a series of holes round the circumference of the lens until the film is punched out, like a tax disc or a postage stamp.) It’s not without risk for me, so it’s going to be a nervy few weeks. The corner of the whipped cream. Border finished, starting the inner frame. 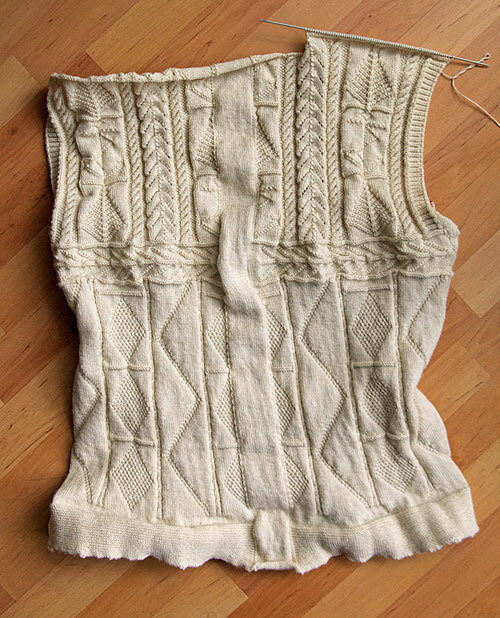 Meanwhile I’ve subdivided the front of the gansey, and have embarked on the shoulder straps. As it’s a cardigan, I’m not as worried as I usually am about a deep neckline—the buttons or zip will allow the wearer to determine the height of the neck as they see fit. So there’s only 5 stitches indented to shape the neck over 10 rows. As the width of the gansey is 210 stitches, each shoulder strap is 70 stitches wide. I’m going to replicate the herringbone from below the yoke, knit it all from the front and join it so the seam is on the back. Hi Gordon, I am sure the op will be a wonderful success. Thanks for sharing that flickr site, Nigel – that’s a spectacular gansey cardigan and I can’t believe the speed knitting involved to complete it in two months! My hands would be in casts! Hi Nigel, Lynne – that is a stunning cardy, isn’t it? Though the way the flags reverse each repeat rather does my head in! I love how the cables are looking. They are just little ropes that work so well with the rest of the gansey. I agree, & I’m addicted to cables, I even add them to patterns that traditionally didn’t have them! In this case, I think the moss stitch either side makes a big difference to the way they look, and makes them stand out more. That blue cardigan is playing with the shadows. The reversing flags are somehow even more mind-twisting in the column up the middle of the back. 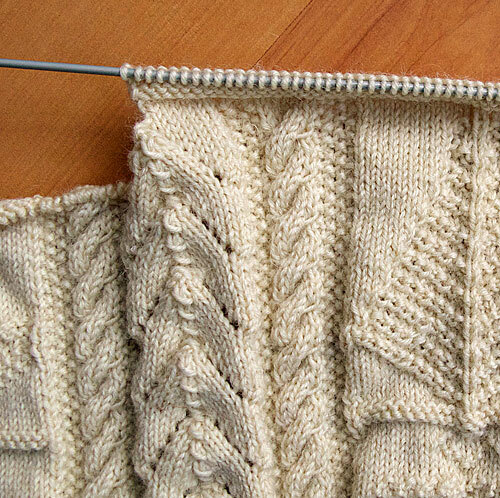 On the other hand, there’s something impressively reliable feeling about the cables on your cardigan. I don’t know whether it’s the moss stitch background or the contrast with the zigzag elements. 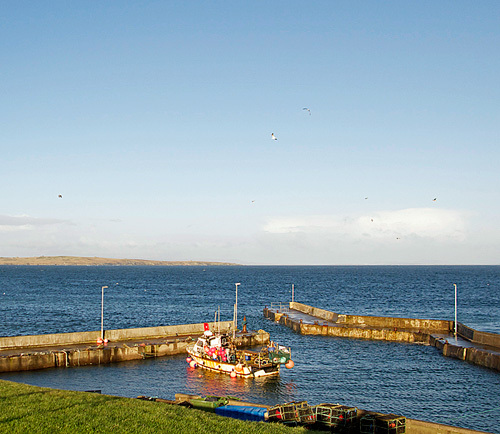 The gansey is looking spectacular! The light color really enhances the delicacy of the pattern. And Margaret’s Whipped Cream is just delicious, effervescent and frothy. I look forward to seeing more photos of both projects as they progress. Whoa Nigel – you’re not fooling around, are you? That’s a hearty cardigan. I love it – particularly the drama of the back. It’s so odd to see Fiona model it over a summer skirt though – I could use it right now on this 12 °C winter day. 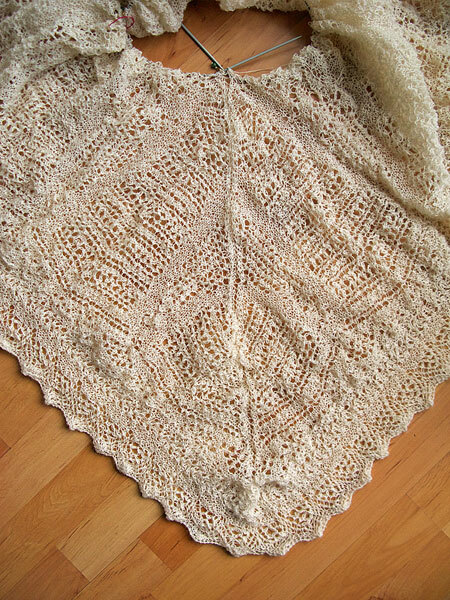 I just sent Gordon pictures of a gansey-inspired afghan/quilt I knitted for my sister’s recent wedding. I’m just a big-needle slouch compared to the rest of you, but hey, I’m working up to it. The pics will go up tomorrow, Gracie, and very nice they are too. I like to think of the cables in my current project as load-bearing, offering structural support in high winds. Lovely sweater. Hope you are feeling better.